At Ionic Industries we have published another free guide to replacing the battery inside a Braun Oral-B electric toothbrush, this time for the Professional Care Type 3756 and 3754 models. The Type 3756 and 3754 toothbrushes go by various names on the packaging, including the Professional Care, TriZone or PRO 500, 550, 600, 650, 700, 800, 1000, 2000, 3000 and 4000 etc. but all have similar internals. These are one of Braun Oral-B’s most popular ranges of electric toothbrush so we get a lot of readers of our guide! Check out the full toothbrush repair guide here or post a comment or question below. Previous post: Why Isn’t It Easier to Replace a Toothbrush Battery? Excellent, clear and concise instructions. As a reasonably competent diy-er I had no problems following the step-by-step guide to replace the battery in a Braun Professional 1000 toothbrush. One minor word of warning – If modifying the battery carrier to take a larger (49mm) battery be very careful not to break the clip mounted on the end of the carrier that holds the circuit board onto the carrier when fitted. As considerable force is required to cut out the battery carrier to take the larger battery this is easily done – be warned! Excellent instructions, just replaced 2 toothbrush batteries. One tip, it’s not necessary to desolder the coil, as it comes away with the board in my toothbrush. At first I saw this as a challenge but actually the instructions make the job of replacing the battery quite easy. I would strongly recommend using a desoldering pump as stated in the instructions. I didn’t and found it much more difficult to desolder the fine copper wires without melting the plastic battery compartment as there is a lot of solder around the joints. I have since bought one for a couple of pounds. 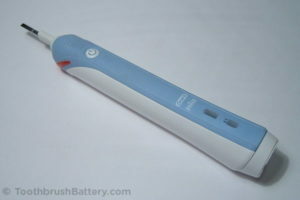 The ability to modify the toothbrush to take a higher capacity battery is brilliant too and quite easy. I used a No 10A scalpel blade to remove the plastic spacing ribs. Replacement battery delivered very quickly and is not to expensive. Another brush successfully revived! Thanks for the tips about the desoldering pump and scalpel blade Ian. Was so fortunate to find this tutorial and incredibly well-done instructions. I’m too stubborn and cheap to purchase new toothbrushes, so I replaced batteries with the larger 49mm NiMH on Oral B 3000/3756 series brushes and they work like new now! Thanks for saving me tons of money! Just replaced battery supplied by you using your very clear instruction guide. I modified the battery carrier following your instructions to take the longer battery and reassembled with no problems and no glue required. My tip to others would be to use desoldering braid instead of a desolder pump if you can as it’s much easier and kinder to the circuit board. Thanks very much Ionic. Thanks for the feedback Keith and for the tip about using desolder braid. Another toothbrush is kept running! Fantastic. I have thrown away two brushes in the past, but no more! I invested in a small soldering iron and there was no holding me back; one toothbrush now up and running again. If I can do it anyone can. Thank you! Thanks Jane, I’m glad you got your brush up and running again. Another one saved from the landfill! Not a lot to add to all that has been said before. It looks a daunting task but actually it is quite easy. However! I can add a few pointers to the very easy-to-follow instructions. 1. Don’t do as I did and put the battery in the wrong way round! How I managed it I have no idea because the photos clearly show the orientation. The result is, the motor runs permanently and will not turn off and one of the chips gets hot very quickly. Diagnosed easily by Rob and the brush now works a treat. 2. Do use a very small soldering iron tip. Mine is 1mm. You must use a solder sucker or solder wick. 3. Put the bottom end into near-boiling water before you remove the base and it will come apart easily and the securing lug will not snap off. Thanks for the tips John, glad you got it working. Another toothbrush saved from the landfill! You don’t actually need to put the bottom in hot water. If you feel carefully, about 5-6mm up from the seam, below the plug indicator, you can feel the hole the securing lug snaps into. Push there with a small screwdriver or the like while pulling back in the charger. That’s how it’s designed to come apart! All went well but this procedure is not for the faint hearted! I last did soldering of printed circuit boards when I was 18 (now 70!). Took about one and a half hours but I can see that second time around about 30 minutes should be plenty. Very clear instructions….thank you. Glad to hear you got your toothbrush up and running again Trevor! Thanks for the feedback. Hardest part was getting the bottom off… after that the instructions were clear and easy to follow. I agree with the other comments – a solder pump was much easier to use than desolder wick. Thanks! Good work on getting it apart Andrew 🙂 Glad the instructions were helpful! Many thanks for your excellent guide for the battery replacement for the Braun Oral-B Pro type 3756. I have just replaced the battery with the larger version and no problems following your guide at all. Detailed images helped so well, and I got to use my solder pump for the first time! Hi Kim, great to hear about your successful repair! You mention that you’re looking for a battery for your Sonicare flosser. We have details of batteries for the Sonicare Airfloss here. Thanks so much for the excellent, detailed guide. I am not an electronics geek, but was able to follow the guide without too much trouble. I was grateful for John’s post as I also got the battery in the wrong way the first time. Thanks to John I was able to diagnose and correct the problem although this took some time. I had to solder an extra piece of tab to the positive terminal of the battery since it was cut too short. In the end it got a little messy since I had repaired the solder joints twice and added extra battery solder, but the toothbrush works as good as new! Ionic is providing a valuable service to consumers and the environment –THANKS! Great to hear you got your toothbrush repaired and working again Rick! I have successfully replaced the battery in my Professional Care 3756 with the optional longer battery and like other respondents would like to mention the the very helpful Ionic Industries detailed guide. I would however suggest the better way to trim the new battery terminals would be to cut down the width from the end before cutting across, as indicated in the guide. I followed the instructions and cut across first, this required enough scissor pressure to start the cut which then cut right across. Luckily there was still enough remaining length of terminal to try again and this time I easily cut from the end along the centre. It was then easy to fold back the half width and cut it off without danger of cutting right across. I’m happy to say my toothbrush is now back to full function. I followed your detailed and accurate instructions and replaced the battery in my 3756 toothbrush with the higher capacity one. All went well and the red light flashed on when soldering the final battery connection in place. However, I have been unable to get the toothbrush to go into charging mode. I have checked all the usual things: coil connections and continuity (1.4 Ohms), motor connections (I checked it ran from a battery across its terminals when disassembled), no solder splashes. All I get is the flashing red light when the power switch is pressed. I have tried disconnecting the new battery and wiring in the old battery, but no joy. I partially discharged the new battery externally to see if that would help – again, no joy. Any ideas? Hi David, good work with the install and checks – strange that it’s not working 🙁 Have you tried leaving the brush on the charger for an hour? Sometimes it takes up to an hour before the toothbrush even acknowledges that it’s charging! It could also be that the charger is faulty but that’s a pretty rare occurrence. Are you able to measure the voltage of the battery? You can also try leaving it running until it shuts off then give it a full 24 hour charge. I did leave the toothbrush on the charger for 24 hours but no joy. Maybe during disassembly I could have shorted something on the PCB although I’m not aware of doing so. Is there a way of resetting the ‘intelligent’ battery meter? I would have thought that it is waiting for a charge since the red light is flashing. I’ll do a bit more experimenting to see why the charging circuit is apparently not working (the time pressure is off since my wife insisted on having a replacement toothbrush!! One question: there are what appears to be 2 small ferrite pieces in the main moulding towards the charging end of the toothbrush – any idea of their purpose as they don’t appear to be part of the charging magnetic circuit? I believe the two beads are a catalyst to absorb any gases (i.e. hydrogen) given off by the battery in the rare situation that it over charges. You’re right that they’re not part of the induction charging circuit. Regarding your own toothbrush, the battery meter in the current 3756 isn’t sophisticated enough to adapt itself so it won’t need resetting. I’d suggest re-fitting the old battery and checking for shorts on the PCB – a common one is the pressure sensor switch (if fitted) connection touching the positive battery connection. However, it’s more likely with yours that one of the charging coil wires has come off. Also check that no surface-mount components have moved on the PCB near to where you’ve been soldering. I have now repaired ‘my’ toothbrush (since my wife got a new one!) and was very careful when disconnecting the battery. Before this I checked the battery voltage on the tooth brush at full charge (1.386V) and when empty (red light, 1.232V). I checked the replacement battery was between these limits (it was 1.271V) before fitting. Everything went according to plan and I am now getting the full use of the higher capacity battery. Hi David, great to hear you got the toothbrush up and running and have given it a new lease of life! I have successfully changed the battery and the tooth brush now functions just like new. The instructions are very clear, precise and accurate; well done and thanks for the information. One suggestion though: – the polarity of the old battery was clearly marked but the new battery (supplied through your website) had no polarity markings at all. Using my meter I was easily able to identify the correct polarity and connected it up correctly. As a suggestion maybe ensure that all replacement batteries supplied have polarity identification and make reference in the re-assembly information, or if they are supplied without markings then suggest using a voltmeter to determine correct polarity otherwise if reversed, damage could occur. In summary, an excellent set of instructions that achieve the end result in a very easy to follow manner. Hi John, great to hear the instructions were useful. Thanks for the tip about battery polarity. We have put an additional photo on the battery listing showing the groove around the outside of the battery – this is at the positive end. The battery in my toothbrush was appearing to charge but would die almost immediately. I bought a new longer version from yourselves and installed it according to your excellent instructions. It then charged for about 36 hours (flashing green) being tried for a while. However, it would only run for about 4 minutes (and rather slowly at that) before running flat and flashing red. A further charge (another 12 hours plus) didn’t help and it now goes flat almost immediately. This is almost exactly the same as the old battery was doing. Do you have any thoughts please? Hi Dave, I think the first thing to do would be to run through our trouble-shooting tips, particularly the ones about the soldering and coil wires. I’ve replace the toothbrush battery for a new one of 2100mAh and the first charge lasted 10 days, the second only a couple of them. I’ve replaced before seen this site, a friend of mine told me how to do it. My question is, it’s due to the quality of the battery? I mean, the old one was 1600mAh. 2100mAh are 2100mAh, it is possible that it only lasts one cycle? Hi Antonio, it could be a faulty battery but run through the checks on our toothbrush trouble-shooting page and see if that helps. I did change the battery to a 3756 and it lasted one cycle for 10 days. The second lasted 2, the third cycle 2… I redo the whole work, I disconnected the battery and weld again. I charge at full and lasted 10 days again, with the same battery, but the second cycle lasted 2… The toothbrush doesn’t allow to charge the battery fully if you don’t disconnect it from the circuit. Is not a battery problem. I read your trouble-shooting page. No solution fit to my case I think. After 2 days and the red light coming on, can you try the 10-second charge trick? i.e. run the toothbrush until it stops, put it on charge for 10 seconds, run it until it stops, charge it for 10 seconds, and so on until it will no longer run. When using the Braun 3756 battery replacement instructions – they are excellent by the way – I noticed one little remark that needs to be added. That is, when trimming down the replacement battery tab to make it narrower, you should use scissors. It doesn’t say WHAT to use to trim the small tab down. Just keep that in mind on the tabs for the replacement battery. I just replaced both of ours and they now work just fine. Better than buying new toothbrushes, ha? Did the replacement regarding the instruction. Great thing! Thank you! Unfortunately, the pressure warning light is shining all the time if the brush is on. Everything looks okay and I don’t know where I did the mistake. I removed the (desoldered) the pressure warning switch and turned the brush on, no change. Don’t know what to do. How can I fix that problem with the pressure warning light, which is shining all the time? Sorry for spaming. Now I know – after desoldering the wires for the pressure light, that if the right wire is soldered on, the pressure warning light is shining constantly (for orientation: coil on the right side and brush is lying horizontally in front of me). But I did not change anything on the PCB, and the wires are not touching anything. So what is the problem? Could you please help. Hi Hanno, Glad to hear you found what was causing the problem. Yes the pressure sensing switch is connected to the PCB very close to the positive solder tag from the battery so these can easily touch each other. Make sure the battery tag has been narrowed and folds closely around the edge of the PCB. Just wanted to say thanks for the clear guide, and all went very smoothly, including the upgrade to a higher capacity battery. I think the thing I enjoyed most (other than restoring my toothbrush to working order) was the feeling of fighting back against that damned planned obsolescence! Clear instructions. I got the longer battery and modified the plastic cage. The new battery however will not charge, no green charging light. It was charging the old battery previously so I am not sure what happened. The new battery had enough power to run the motor so I know the batter was soldered on properly. Somehow the charging mechanism doesn’t work after reassembly. Have a look through our toothbrush battery problem solving tips. It’s probably the charging coil that is either not soldered on quite right or the copper wire has snapped. Excellent instructions, thank you. I found it a bit fiddly but I did the upgrade to larger battery and it all worked first time. I successfully rebatteried my wife’s fancier Braun last year, so this is beginning to become a habit for me, thanks to Ionic. Great stuff. A brilliant, clear set of instructions that made the job very easy to complete. Everything back in working order, great and thanks for the suggestion to replace with a bigger battery, much better than the original. The instructions and layout/navigation through the site is second to none. I have never come across a tutorial that has been so considered & precise. Well done. As another said “should have used a desoldering pump” then I would have found it even easier. I like the ethic of trying to repair things rather than binning & buying a new product. Molto bello, spiegato bene, complimenti. Thanks Maximilian. If the charging light is not illuminating please read the help available on our support page. I’ve replaced my battery yesterday and at first I was a bit down because I thought it didn’t worked – no charging light, looked dead. There was some water inside and the board was little corroded so I assumed I broke it completely during cleaning or soldering. I started to accept the fact I would need to buy a new toothbrush anyway but decided to give it a try and left it on the changer over night. And guess what? After few hours on the charger without any sign of life it started blinking! And it’s working again! I followed the guide and replaced with a larger battery. My 1st time trying to fix a gadget, helped by a friend with a solder iron. We had one snag, the two copper wires on the side broke but I think they were long enough to solder back on. It charges and turns on but the pressure sensor light is always on. Is there a way to disable it as I don’t need it anymore and that’ll stop it draining the battery. If the pressure sensor light is permanently on there is probably a short circuit somewhere. Check your soldering around where the pressure switch is joined to the PCB and where the LED wires join the PCB. You can always remove the pressure switch and see if the brush works correctly without the switch plate installed. I’m going to leave it alone as I don’t have a soldering iron anymore. Also I’m getting 50 mins and counting out of the bigger battery, compared to probably 28 mins (1 week’s brushing 2 min twice a day). So I’m very happy with my first attempt. Thanks for the guide! An updated tip on this issue – if the pressure sensor light is stuck on then the pressure sensor switch is either not connected or not clipped onto the toothbrush assembly correctly at the head end. To me there seems only one way to connect the pressure sensor. I have a problem where the pressure light is on all the time. I checked and resoldered where the + battery connector is on the side of the pressure connector soldering. Can not see any short circuit. Can there be a short circut under the PCB where the + battery strip is folded? Superb, clear instructions. A bit on the fiddly side to do but well worth the effort. I took the plunge and decided to go for the larger battery but had no difficulties at all. That’s fixed my toothbrush, now to do the wife’s. Many thanks for your guide. Hi! I just reassembled my toothbrush after following your instructions. I had to modify the battery holder as I bought a longer battery and it worked like a charm. The brush is now in the charger and it is blinking green. :-). So far so good eh? Thanks for a very nice guide. Great instructions. I’ve changed the battery – charged it up – motor works – but the head doesn’t vibrate/rotate. The motor is moving the gear from side to side but I’m not getting any movement above that. Also, the red light flashes (the one that indicates the battery needs recharging) after every use even though the battery seems fully charged. Regarding the motor, you’ll need to open up the handle and look at the gear linkages. There is probably a reciprocating arm that has been disconnected from a cam. Regarding the red light, once the battery is fully run down and recharged the internal battery-meter should re-sync and this will stop happening. When the brush is switched off the pressure sensor warning light flashes every 3seconds for about half a second. When switched on the tootbrush works fine. Even the pressure sensor seem to work: The light flashes when a certain pressure is detected and is permanently on when the pressure get even higher. Basically it works but my wife cant stand the flashing and told me she will buy a new one. Hi, thanks very much for your great instructions. I was just wondering what the spring in the base of the toothbrush is for. Despite soaking in warm water the clip broke when I opened the toothbrush housing so with the spring in it won’t hold shut. I don’t want to glue the base up in case I want to replace the battery again in the future but the toothbrush seems to work just as well with or without the spring. Is it just intended to support the battery and therefore is not really vital or does it serve another purpose? The spring seems to hold all the inner workings up against the top of the outer handle, not just the battery. I’d suggest removing the spring for a few weeks while you check that the battery runs and charges well. Then re-fit the spring and use a small spot of superglue on just the plastic tab of the clip to keep the base shut. No need to go glueing around the seal. If you use a small enough amount the base can still be removed next time you want to replace the battery. Wow, thanx a million! That was the best of instructions. I now have an almost new toothbrush with an elongated battery life! Hi. Thanks for the information on this site. I have replaced batteries in a previous generation of Braun toothbrushes but there are enough differences for this site to be really useful. My only query is why unsolder the coil? I did not bother and had no problem replacing the battery. Great, made it look so simple and it was. Very informative and with precise instructions took me just 20 minutes. Thanks . When replacing the battery with the longer one, why do you have to bend the tags in that “in and back out again then up” pattern with a flat screwdriver tip? Are the bends required to hold something in place? Hi Daniel, This is a reliability factor – the bends in the solder tags are to prevent the vibration of the toothbrush from breaking the solder joints or lifting the solder pad off the PCB. Cheers, the tags on my battery were long enough, even with the bends so I am happy I kept the bends. It is nice to know what they were for. That’s another one saved from landfill – the 1400mAh 4/5 AA replaced with a 2700mAh full AA. The only fiddly part of the guide was avoiding melting the plastic posts on the pressure warning light cradle. I lost one but the other was fine. It went back together properly anyway. The hot water tip was good and saved my base clip. Got the Braun version overhauled (w/ the larger battery) thanks to the detailed how-to. Didn’t see any other comments regarding battery charging protocol, so I checked while disassembled: Average charge current is about 90 mA; the highest voltage I saw while charging was about 1.5V; and the discharge cutoff voltage (under load) was slightly above 1.0 V. So, I guess we can’t blame the charging regimen for the apparent ‘shortened battery life’, unless someone with an ‘updated battery’ has other data. Couple of other observations: 1) The PCB in the Braun is of highest quality, in the sense that it would be difficult (but not impossible) to delaminate the traces by overheating with a soldering iron. That said, I would still recommend a temperature-controlled soldering station, a justifiable investment for all electronics repair. 2) The board has Surface Mount Devices (SMD) so when you’re done soldering, use a magnifying glass to check around to make sure there aren’t any solder splashes or solder balls trying to short something out or come loose and cause a weird/intermittent problem in the future. Good morning. I have kept your very good instructions in my web ‘Favourites’ since I last used them to replace the battery in my Braun Oral B 3000 toothbrush two and a half years ago. Last time I modified the case to take the longer battery, which was easily undertaken with a small drilling/modification tool: eg. Black & Decker Wizard or Dremmel. Therefore, when the initial replacement battery stared to show signs of ageing a month ago, I didn’t delay in ordering a new replacement; knowing that it would be an easy task to return the toothbrush to full working order. Thankfully, the base lugs have remained intact through both disassemblies, and the repaired toothbrush is now on charge as I write. Thank you for the instructions. They are superb. Brilliant instructions however the flashing Red Battery Flat is flashing, but no green charge light when plugged in. Any top tips as it all seems to have been reconnected in the reverse of the deconnection sequence. Check the fine copper wires from the charging coil inside the toothbrush. These can easily break. Brilliantly clear and comprehensive instructions. Thank you! Another successful upgrade completed here. Thank you for guide. My toothbrush is working excellent again. Even better with bigger battery. It was quite easy. I replaced the battery a few years ago with the larger type and it worked well. This is the 2nd replacement battery I have installed, but now after 12 hours charging (green charging light is flashing OK), the motor does not operate with a push of the button. I have checked the soldered joints and they appear OK.
Hi Jon, when you press the button do you get a red flashing light? Have a look through our troubleshooting tips here. No, there’s no red lights or sound when I press the on/off button. Are you able to check the voltage of the battery? It should be above 1.0V to run. Hi. Sorry for late reply. It had 1.2v – so was OK. However, I have just de soldered everything and re soldered all the connections and put it on charge again to reset it on it’s now operating ok. Thanks again for an excellent site and for the help given. Really useful guide to a straightforward battery change. I tried the battery replacement in one of my Braun 3756s some time back and it didn’t work, even though everything looks OK. Today I did the second of the pair and this one appears to be working fine. On the one not working, it appears to charge correctly with the flashing green light. When you press the power button, you can hear and feel the motor try to start for one brief surge, but then nothing else but a flashing red light. Putting the brush on the charger for just a few seconds will “reset” the brush, but it doesn’t improve the function. This brush does NOT have a pressure switch. Any thoughts? Are you able to charge it for 24 hours then measure the battery voltage at the PCB terminals with a voltmeter/multimeter? If it’s over 1.2V the motor should run. Could the gearbox be jammed with debris? Also run through the checks on our Customer Support page. The voltage of the battery measures over 1.3 V. I also applied a charged AA battery with leads to the two terminals of the motor and it ran fine while connected that way. I have looked at the support page and didn’t see anything there about this issue. The battery voltage looks good so if it won’t run then it sounds like a problem with components on the board. Something could have moved or got damaged when soldering in the new battery. I suggest desoldering the battery that’s in it, and solder in its place the wires to the AA rechargeable you mention having. The electronics should now let you press the power button on the PCB and it will power up the motor. Worked perfectly, thanks very much – I modified the battery case and went for the larger version of the battery. So satisfying to renew this battery. Imho, NOTHING that is battery-powered should have a design that requires an extensive teardown in order to replace the battery, be they toothbrushes, mobile phones, laptops…. Otherwise, they’re no better than the original Mini, where the engine must be removed to replace the fan belt (and shockingly, the Mini actually won major design awards – duh). Great to hear about your repair Steven, and thanks for the tip about the plastic lugs at the ends of the coil wires. You’re right, they don’t really matter. Good point about the repairability of battery-powered devices. It’s so important to make this straightforward for end-users! THE NEXT DAY… Once fully-charged, the motor tried to rotate, but the stud the toothbrush head fits on was only vibrating slightly. Dissembled and noted the cam / linkage barely moved. Powered the motor with the battery via ‘jump leads’ and still no joy. Put a drop of penetrating oil down the head shaft / stud, and used silicon oil sparingly on all the cam and gear works, and voila: success. Seems the toothbrush and dead battery may’ve simply sat around too long before the battery was replaced – the linkage was stiff or ‘tired’ – who knows? So if any intrepid souls get everything to work but are stumped by motor straining (but failing) to turn the cam / linkage, hopefully this may help. I replaced the battery and the battery indicator blinks green when charging. But the pressure sensor keeps blinking red (every 3 seconds) when the toothbrush is off. Do you know what causes this? Is the pressure sensor LED blinking in sync with the green charging LED? There could be a short circuit somewhere on the PCB caused by a stray blob or whisker of solder. You can also try desoldering and removing the pressure sensor switch plate – the red LED should then stay on when running but stay off when the brush is off. It did not blink in sync. I desolderd the pressure sensor, but it kept blinking (when brush was off). I have also seen that the charging coil wire is melted in the plastic on one side, could this be the problem? It sounds like there is a short circuit somewhere, possibly at the side of the PCB where the super-fine wires terminate, the ones that run to the LED near the shaft. The melted plastic near the charging coil is not a problem, but both coil wires must be soldered to the PCB and there cannot be any breaks between the solder points and the coil itself. Thanks for the help! I re-soldered all connections and the toothbrush did charge but the pressure light is blinking again. Since it’s not that important, i’m just going to desolder the connection to the light. In case you still have another solution, feel free to post. Hi Ionic, Thanks for the very clear instructions, job done after initial trepidation but I worked through it and felt great satisfaction afterwards. Would have preferred (1) a specific instruction to say that the battery positive terminal must be towards the motor, (2) before reassembly, a note about careful cleaning of all the joints, (3) If the rubber cover was damaged during disassembly (say around the front ring) provided this has been cleaned and dried before reassembly, a small amount of white silicone sealant could be used at both ends of the cover to prevent water entry. (If this is added, silicone sealant needs to be added to the Tools/Parts/Equipment list). Thanks for the feedback and tips Chris! There could be some debris rubbing inside the gearbox, or the frame might be twisted slightly. The current is likely to be over 1 amp with the head attached. How does it run with the inner mechanism removed from the outer casing? Are you able to put a drop of oil on the motor bearings? I did as instructed, however as soon as I put the brush to charge, there is a permanent flashing of the red light on it (the battery indicator) even after waiting more than an hour. It could be a short circuit on the PCB or break in the toothbrush’s charging wires. Read through our troubleshooting tips and see what you find. I have read your excellent instructions on the 3756 toothbrush. Can I reassemble my toothbrush without the pressure warning switch or pressure warning light? I like to keep things simple as I am not very experienced in soldering. can I use an off-the-shelf double A rechargeable battery with tabs? Thanks again for the wonderful site! You can try reassembling without the pressure switch and warning light, but I’m not sure if the motor will still run at full speed as the brush will be in a permanent state of ‘pressure switch activated’ as the switch is a normally closed type. You can use a different double-A battery that has solder tags welded on if you can get them easily at your local shop. Don’t try to solder metal tabs directly to the battery as the heat can damage the battery internally, reducing its capacity and lifespan. Hi there! Thank you for this excellent tutorial. I have change the batteries on two toothbrush till now. Thank you! Brilliant, thanks for this tutorial. I love to make do and mend and dislike consumerism, so this is right up my street. Down with planned obsolescence! 🙂 The brush is now on charge after fitting the larger battery, all seems to work as it should and I’m looking forward to fitting the other replacement battery to my wife’s brush as she made me fit mine first. Batteries delivered fast, many thanks. You’re welcome James. Hope the second toothbrush repair goes well too. Happy brushing! Hi I am very grateful to your suggestion at using a 11mm spanner to push top clip down I was worried I couldn’t get it on correctly. So important to keep it watertight. Thanks for the clear and concise instructions! However, after reassembling and re soldering with the new (upgraded) battery and putting the toothbrush onto charge, I appear to be getting error codes through the green charging LED. I get 5 short flashes when I put the toothbrush initially onto charge, then as the toothbrush is ‘charging’, rather than getting the normal 1 longish flash on the green LED every 1 second or so, I get 2 short flashes every second. The toothbrush doesn’t turn on when I press the button and I’m starting to think it’s not charging. I’ve had it on charge for about 16 hours now and it’s still the same. I’d appreciate any ideas you may have! Hi Seb, have a read through our troubleshooting tips, mainly checking for short circuits, stray solder blobs, etc. Also check that the battery tags are not shorting on anything. My repair was doing this on my first few attempts. If it isnt turning on i would be inclined to say the two battery soldering areas are not solid. Double check them, i used a small screwdriver to try and move the metal tabs to see if they will move after working on them. I must have a hundred solder balls all over my work area trying to get them to adhere to the area nicely. I had an issue with greasy residue being left under the solder preventing a solid connection. It needed heating up and rubbing with cloth to clean. It should show signs of life before re-assembly. Thanks for the guide, i purchased the longer battery with more mAh from your ebay store. I found removing the base & retaining ring easy. I accidently broke the very delicate pressure warning light carrier, luckily it broke on the side that doesnt hold the very thin wires. I wouldnt have attempted this without a solder sucker. I had to triple check my soldering in various spots because there seemed to be brown greasy stuff left from the old solder i was using and more than likely my very old corroded iron which has seen better days. Thank you for an excellent battery replacement guide. Replaced the battery with ‘long life’ version. All went well, put on charger and tge green light blinks, unit remained on charger until green light on solid. Expected a week out of it. Speed seems fine on first use after full charge. It will probable run for a 1 1/2 days (3 cleanings) then its dead for the next one! Even though there are now battery low warnings. I have tried fullyj charging and then letting it run to a stop (about 30 minutes) this ” short life” is repeatable. Almost as though it does not turn off when switched off. Any suggestions.? Hi Martin, It sounds like either the battery is not getting a full charge or that the battery is failing. After a full 24 hours on charge (the green light might be solid for some of this) leave the brush running continuously again with no head attached. You should get an hour of running out of it before the motor starts to slow down. Let us know if you get less than an hour and we can send a replacement. Thanks a lot for this excellent initiative and website to fight reckless consumerism ! Changed my battery successfully, toothbrush is working like a charm and starting its second life now, what a great satisfaction ! – is the way one solders the thin copper wires of the pressure device important? I could not remember which wire was on which soldering point, tried it randomly and luckily it worked. Would it have been the same the other way around? If yes, you should mention it in the reassembly tutorial and if not, it would be nice adding a picture to show the original soldering position of wires. – Second, is there specific guidelines to ensure max battery life? Does the replacement battery has memory? Can i recharge it before it is empty? What are the general best practices to do with this kind of battery? 1. The pressure sensor LED will only illuminate if the wires are connected with the right polarity. It will not harm the LED to be connected in reverse so it is okay to experiment with this connection. 2. We have published some toothbrush care advice on our website. Please add any of your own guidelines. Saved another toothbrush here, thanks so much for the guide! A tip from my dad, who did the soldering work: it can help to desolder the coil first, so the black plastic won’t melt when you desolder the battery. Thanks for the guide – mine is running perfectly now, apart from the pressure light which I think is just a bad connection – I may get round to looking at this at some point. I’m looking forward to upgrading my wife’s brush when the time comes! Thanks again. I bought a battery from you a few weeks ago, the larger capacity one, I followed the excellent guide, and in no time, the brush was back on its base, green LED blinking away. So chuffed was I, that I bought another from you a fortnight ago, and I’ve just done, unknown to her, the wife’s, green LED happily blinking away. Wonder how long it’ll take for her to cotton on , it was down to a 3 day charge cycle! !, mine runs for well over 2weeks!. On a slightly more serious note, I de-soldered from the PCB in the order of, charge coil, neg battery terminal, pressure sensor LED, motor terminals, pressure sensor, pos battery terminal. This way seemed to save melted plastic, however I’m probably nitpicking. Great service, brilliant guide, thanks again. Off now to recycle old battery. Great to hear about your successful repairs Glenn, and thank you for the tip regarding desoldering order. Happy brushing! Thank you. With the longer battery my brush has gone from single use between charges to 4.5 weeks of twice a day! My wife is jealous as her younger brush doesn’t last that long! It means we don’t need to take the charger in the camper van anymore. Thanks for the guide. It really helped. Initially, I did everything per the steps (except de-soldering the pressure warning light connections, also followed a video). Once I fixed it, I see the charging light is blinking but it is not working, not even the red light. So, I checked the troubleshooting guide (this helped too) and reopened to check the soldering points. Looks like one of the motor connections and one end of the battery connection (near the coil) are dry soldered (for the unknowns – it is basically soldering was not done correctly and so disconnected). So, I soldered those two points and voila!! it worked. However, I noticed that red light was blinking when I pressed the button on the PCB (before re-assembling) but I do not see it when I pressed the button after I re-assembled. So, I will watch out for it after a complete discharge. Note on pressure warning light connections: Also, following one of the videos, I did not de-solder the pressure warning light connections and so while handling to remove the battery, the wire got cut. However, I managed to solder the ends of the wire. I hope it would work. Nonetheless, am not bothered much about the pressure light warning. So, I would suggest to de-solder the pressure warning light connections. great guide! I got my toothbrush back together. It started working when I accidentally press the power button. Good to know it works before reassembly. However, when I put it on the base to charge, it has a faster green blinking pattern. Faster than the original green blinking when it charges. The original blink was a slow on and off. Now it has a fast on, slow off. about 0.5seconds on, then 1 second off. I looked at the online copy of the instructions, but there is no info on a faster blinking. Does a faster blink pattern mean something? Hi, check your solder connections for the battery in case one has cracked or come loose. Apart from that, as long as the brush charges and runs okay this is nothing to worry about. Hi, what an awesome guide! Unfortunately my rusty soldering skills melted the plastics holding the pressure warning light wires. Hope that didn’t cause any issue. I must have soldered and desoldered, and then soldered back everything again 3 times and the battery and charger connectors maybe 2 times more. At first, the battery charged then very quickly the charge went dead. Then i notice the charging was a fast blinking green… not normal. Didn’t charge. To cut the story short, now it won’t charge and the charging red light is blinking very fast. When put on the charger, BOTH the red and green lights are blinking fast. Looks to me like a short somewhere but i can’t seem to see any. Any ideas? The most common place to get a short-circuit is on the PCB around the positive battery terminal (near the motor). It is also quite easy to heat up the surrounding surface-mount components and cause them to slide off their pads. Another toothbrush saved from an unnecessary demise, thank you Ionic. My most recent repair for a Braun 3754, upon successful battery change the charge light blinks five times on button press but the motor won’t run. Charges correctly via the coil and I can trigger a reset/lights test via a press & hold but the motor won’t run. Feel like it’s a voltage detection circuit error. Any way to force start the motor to re-educate the battery voltage IC? Hi Ash, Putting it on the charger for 10 seconds will normally ‘reset’ the brush to accept the new battery. Other than that, have a look at our troubleshooting tips here. Send us an email if this doesn’t get you working.